Bob Arum acknowledged Amir Khan’s chin is the primary reason most potential consumers consider Khan incapable of upsetting Terence Crawford on April 20. Arum also asserted that Crawford cannot attempt strictly to out-box the former IBF/WBA 140-pound champion in their 12-round, 147-pound title bout a week from Saturday night in New York. According to Arum, whose company promotes Crawford, that strategy will grant England’s Khan a greater opportunity to edge Crawford in a fight Crawford has been installed as a 16-1 favorite to win by numerous odds-makers. Crawford has won both of his welterweight fights by technical knockout. The former lightweight and junior welterweight champion stopped Australia’s Jeff Horn (19-1-1, 13 KOs) in the ninth round to win the WBO 147-pound championship June 9 at MGM Grand Garden Arena in Las Vegas. In his first title defense, Crawford beat Jose Benavidez Jr. (27-1, 18 KOs) by 12th-round TKO on October 13 at CHI Health Center in Omaha, Nebraska, Crawford’s hometown. Khan has not been knocked out in any of his four fights contested at the welterweight limit of 147 pounds, but Breidis Prescott knocked him out in the first round of a lightweight bout 10½ years ago. Danny Garcia also knocked out Khan in the fourth round of a junior welterweight fight in July 2012. In May 2016, Canelo Alvarez knocked Khan unconscious in the sixth round of a middleweight match contested at a contractually mandated catch weight of 155 pounds. 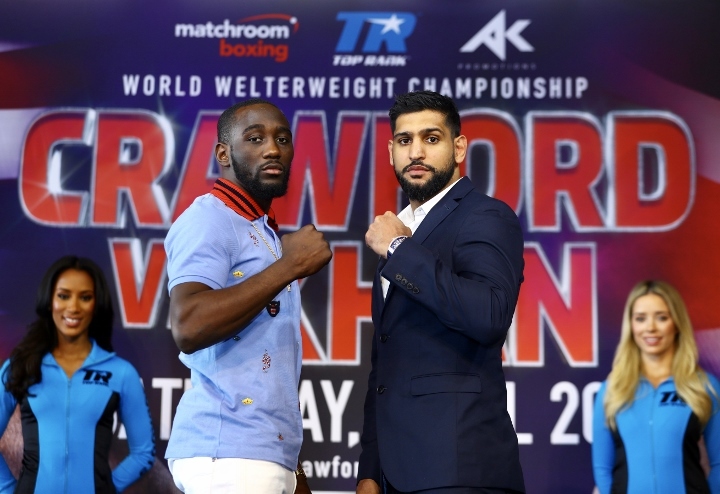 The bout between the 31-year-old Crawford (34-0, 25 KOs) and the 32-year-old Khan (33-4, 20 KOs) will be distributed by ESPN as the main event of a four-fight, pay-per-view telecast from Madison Square Garden in New York. [QUOTE=NachoMan;19647305]Feather chinned? [/QUOTE] Lol was thinking glass, but idk what happened there. Was gifted a very good Scotch recently and was sauced by then.